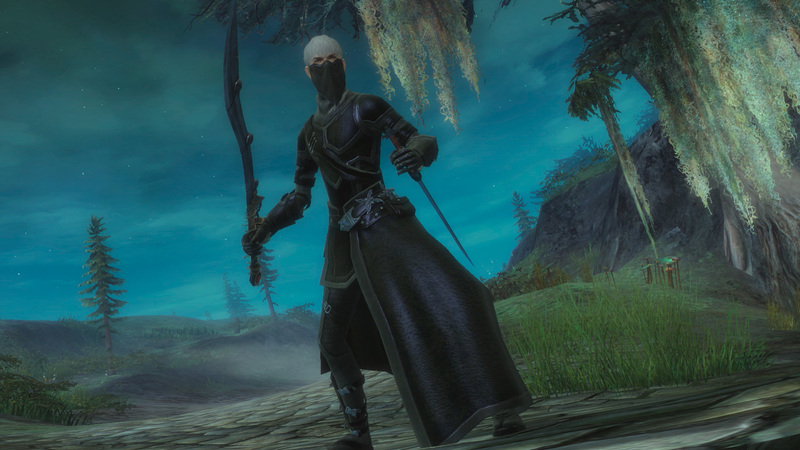 A master of stealth and surprise, the thief is deadly in single combat—particularly when catching enemies off guard. 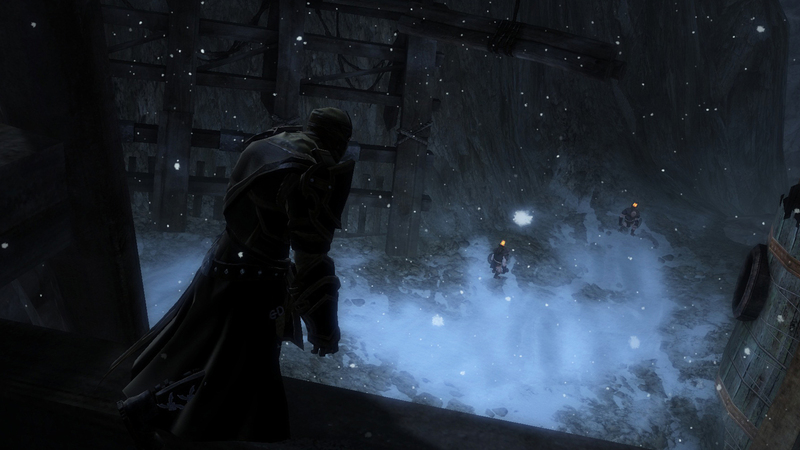 Thieves compensate for their relatively low armor and health by being quick and evasive. They can move through the shadows, vanish into thin air, or steal items from their opponents and use them as weapons. Enemies should watch their backs, or the thief will watch it for them. 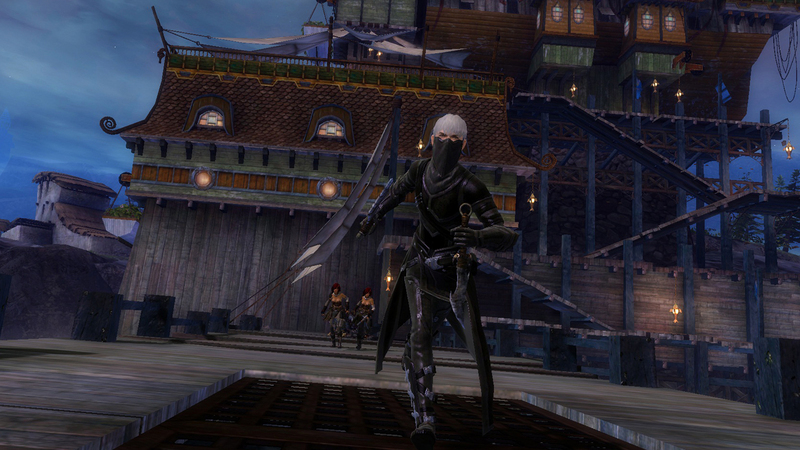 While other professions rely on recharge rate for their weapon skills in combat, thieves rely on Initiative. Thieves have ten points of Initiative to use, and they gain back one point every second. Weapon skills cost Initiative points, but they have no recharge time, so thieves can use them back-to-back. This allows the thief to keep their options open at all times or unleash a rapid flurry of powerful attacks. Thieves make use of a special skill called Steal, which generates a useful environmental weapon in the thieves' hands based on the monster or player that they stole from. For example, when stealing from a moa bird, a thief might get a handful of feathers that they can throw to blind enemies around them. When using a main hand and off-hand weapon combination, the thief differs from other professions. Their first two skills come from the main hand weapon, while the last two skills come from the off-hand weapon. The final skill, called their Dual Skill, is determined by both weapons. For example, a thief with two daggers will have Leaping Death Blossom as their Dual Skill, but a thief with a dagger and a pistol will have Shadow Shot as their Dual Skill. Stealth—Thieves can disappear into the shadows. This allows them to become invisible to enemy players and to ignore aggro. When in Stealth mode, the thief can still be damaged, which temporarily reveals them. When a thief is hidden, attacking will break the deception. Shadow Stepping—Thieves can get in and out of battle quickly by using a technique called Shadow Stepping. This skill allows them to disappear from one location and then instantly appear at a different location by traveling through the shadows. Traps—Thieves use traps to ambush unsuspecting enemies and control areas. For example, Shadow Trap is a trap that puts the thief into Stealth and Shadow Steps them back to the trap's location. Initiative is the thief's resource mechanic. A thief has ten points of Initiative that refill at a rate of one point per second both in and out of combat. Skill 1 on their bar is always free, but the other thief weapon skills all cost Initiative instead of having recharge. Thief Heal, Utility, and Elite skills do not cost Initiative and still have a recharge cost. Above their skill bar, all thieves have a special skill called Steal that can be used on enemies. It does not actually steal a real item from an opponent, but rather generates an appropriate environmental weapon based on the target. Stealing does not break stealth, and cannot be used often. When a thief steals, it can open up a range of support and control options that are less prominent in his basic skills. Dual Skills are special skills that thieves acquire in slot 3 of their weapon bar that are based on both weapons they are wielding. A dual skill is determined by both main hand and offhand weapons, and can vary depending on the order. 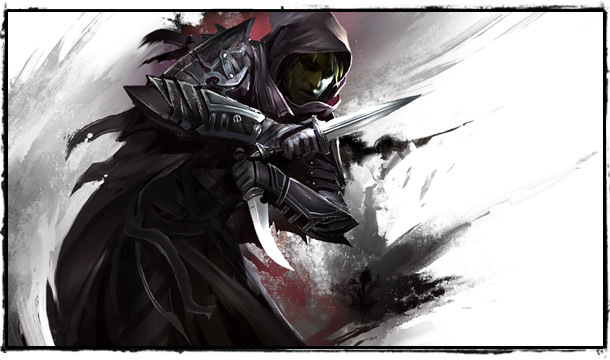 For example, a thief wielding a pistol main hand with dagger offhand (Shadow Strike) will have a different dual skill than a thief wielding a dagger main hand and pistol offhand (Shadow Shot). The shortbow is the one exception to this rule; it does not have a dual skill. Stealth has a limited duration and can be broken in various ways. Most stealth is lost when a player attacks through it. Some stealth breaks when the player moves. While in stealth, a player can still take damage and will temporarily appear in the world when they do. Shadow Stepping is a teleport mechanic used by the thief profession to get in and out of battle. A thief may only shadow step where normal movement is possible and may not use it to teleport through a gate or other blocking area.